Guadalupe Valdés is a professor at Stanford University. She is also a founding partner of Understanding Language, an initiative that focuses attention on the role of language in subject-area learning, with a focus on helping English language learners (ELLs)/emergent bilinguals (EBs). 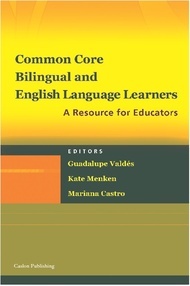 Valdés’ work over a period of 30 years has focused on the English–Spanish bilingualism of U.S. Latinos and on discovering and describing how two languages are developed, used, and maintained by individuals who become bilingual in immigrant communities. Kate Menken is an associate professor of linguistics at Queens College of the City University of New York (CUNY), and a research fellow at the Research Institute for the Study of Language in Urban Society at the CUNY Graduate Center. She is also co-principal investigator of the CUNY–New York State Initiative for Emergent Bilinguals, which develops the knowledge base of school principals and staff to transform language policies and practices in schools enrolling emergent bilinguals (EBs).